According to a recent paper, the common practice of rarefying (randomly subsampling your 16S reads), is statistically incorrect and should be abandoned in favor of more sophisticated ‘mixture-model’ approaches favored by RNA-Seq analysis software. The authors give a basic thought experiment to help clarify their reasoning. I’ve copied the figure below. It basically shows what happens when one rarifies library “B” from 1000 reads to 100 reads in order to match library “A.” This is a standard procedure, even in the QIIME workflow. 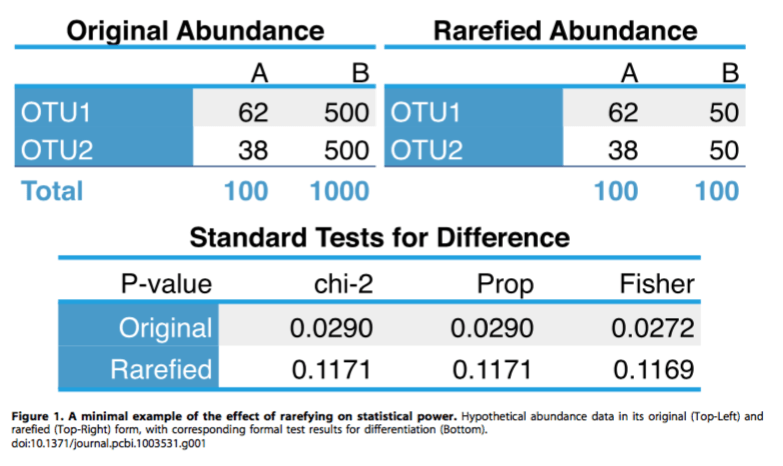 By dividing the library size by 10, the variance of the data in B goes up by 10, and thus the statistical power to differentiate between OTU1 and OTU2’s abundances in samples A and B is lost. Fig 1. An example of the effect of rarefying on statistical power. The solution to the rarefying problem is to take advantage of methods from the RNA-Seq world in order to determine differential taxonomic abundances, just as differential transcript abundances are calculated by the same methods. The R package, phyloseq, provides an R container for taxonomic datasets from Qiime (in the BIOM format). It also provides a convenient set of extensions that allow analysis of this data with RNA-Seq methods like edgeR and DESeq2.